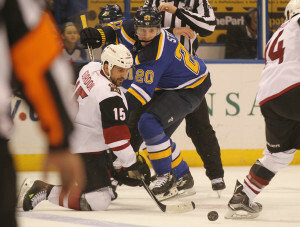 The St. Louis Blues scored five straight goals including four in the third period to rally from an early 2-0 deficit to beat the Arizona Coyotes 5-2, Monday night at Scottrade Center. The win moves the Blues back into a first-place tie with the Dallas Stars in the Central Division. Each team has 105 points with two games to play. The Blues finish the season against the defending Stanley Cup champs on Thursday in Chicago, then back home Saturday against Washington, the top points team in the NHL. It will also signify the return of T.J. Oshie in his first game back in St. Louis since being traded this offseason. Vladimir Tarasenko got his 37th goal midway through the third period for the go-ahead score. Kyle Brodziak scored twice, Troy Brouwer and Patrik Berglund also scored and Brian Elliott won his 10th consecutive decision. Elliott appears to be the starter heading into the playoffs after the injury to Jake Allen on Sunday.